Sitting at a desk all day can kill you. Sitting for prolonged periods, even if you exercise regularly, increases your risk of death from heart disease and other factors. So what’s a geek lawyer to do? 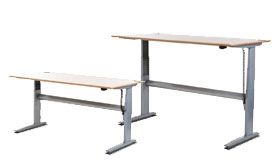 One answer is the GeekDesk, a motor-operated adjustable-height desk. Sit at it for awhile and then, with the press of a button, raise it up and stand at it. Do I have one of these things? I wish I did, but I don’t. However, I did get to try one out when the GeekDesk folks exhibited at this year’s ABA Techshow. What I like about it is that it doesn’t require you to choose between a sitting desk and a standing desk. Press a button, raise it up. Press the button again, drop it back down. There’s even one version, the GeekDesk Max, where you can program four height presets, so it always goes right back to the level you like. It’s not the prettiest piece of furniture — just a steel frame with a veneer top. It does, at least, have channels so your wires and cables don’t get tangled with all the raising and lowering. Various versions are available. Prices range from $749 for the smallest to $985 for the largest sized GeekDesk Max. And there is a shipping charge of $125 on top of that. But, hey, if it can buy you a few more years, then it’s a small price to pay.